Stir fry. Super versatile. You can put anything into it and it tastes great. A variety or sauces, vegetables, and meats! And you know what? I have been in a stir-fry rut. For years (years, people!) I have made my stir fry the same way: chicken, bag of frozen stir fry veggies, store bought teriyaki sauce, dash of red pepper flakes; done. Now don’t get me wrong, this stir fry is great, but it is just the same old thing. Not anymore. I have finally diversified. I swapped out my chicken for steak, made a sauce, and didn’t use frozen veggies, and the verdict: great! 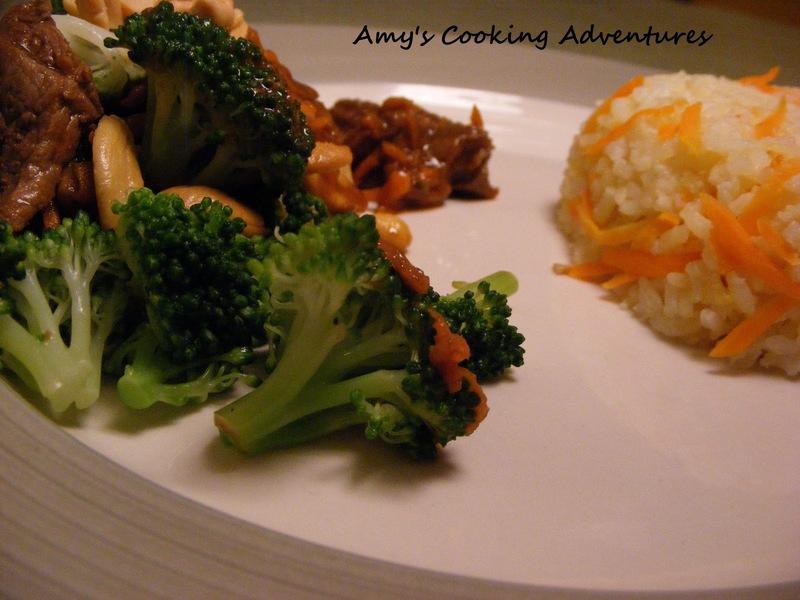 Though I will still make our same old chicken stir fry, this one is a definite winner! A word of warning: I put nearly ½ tsp of cayenne pepper into my stir fry and this makes it very spicy. If you don’t like spice, just use a dash of the pepper. Remember the other day when my son wouldn’t eat pizza? He totally ate this super spicy stir fry AND asked for more! He even ate a "lil tree flower" (broccoli) for the first time! Perhaps I just need to make everything super spicy for him. HHmmmm…..
Heat the olive oil in a large skillet on medium-high heat. Add the garlic and the steak; cook about 8 minutes or until steak is fully cooked. Meanwhile, steam broccoli 3 to 4 minutes until tender-crisp. Once the steak is cooked, stir in dressing, soy sauce, pepper, and carrots. Cook for 2 minutes or until heated through, stirring occasionally. 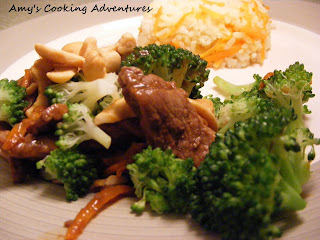 Toss with nuts and broccoli and serve with rice.